"I'm flattered that Dredg were inspired in part by my essay, very interested to listen to the results, and much looking forward to joining them at Housing Works," Rushdie adds. 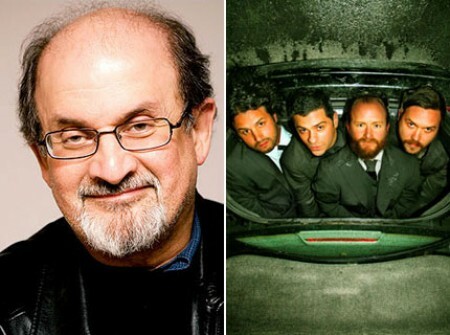 Salman Rushdie is the author of nine novels, including Midnight’s Children (which was awarded the Booker Prize in 1981, and, in 2008, was voted the “Best of the Booker”), The Satanic Verses (winner of the Whitbread Prize for Best Novel), The Ground Beneath Her Feet (winner of the Eurasian section of the Commonwealth Prize), Fury (a New York Times Notable Book) and Enchantress of Florence. He is also the author of a book of stories and four works of nonfiction. He is co-editor of Mirrorwork, an anthology of contemporary Indian writing. In 2007 Rushdie was awarded a knighthood for services to literature, and in 2008 he was elected to the American Academy of Arts and Letters. Dredg is a four-piece progressive rock band from the San Francisco Bay Area formed in 1993. They have released four albums, including 2002's El Cielo and 2005’s Catch Without Arms, both on Interscope Records. This year the band, which is composed of vocalist/guitarist Gavin Hayes, bassist Drew Roulette, guitarist Mark Engles and drummer Dino Campanella, released The Pariah, The Parrot, The Delusion on their own label Ohlone Recordings through Warner Music Group's Independent Label Group. Dredg has toured extensively in North America and Europe, and has played numerous festivals, including Coachella and Outside Lands. The SPIN.com Book Club (spin.com/bookclub) is an eclectic collection of literary-minded musicians (including Dredg’s Drew Roulette) who recommend and discuss books that have influenced their songwriting and musical careers. The Book Club, created and spearheaded by writer and music journalist Emily Zemler, hopes to highlight the influence of literature on music, promote literacy, foster a love of reading among music fans, and raise money for nonprofit organizations. This is the third Liner Notes event, a series established and organized by Zemler with the help of SPIN and Housing Works. The flagship event, headlined by musician Tegan Quin (Tegan and Sara) and author Augusten Burroughs on September 4, 2008 raised over $8,000 for Housing Works, and a pairing of musician Amanda Palmer and author Neil Gaiman on June 3, 2009 raised over $10,000. Housing Works Bookstore Cafe is a nonprofit bookstore, cafe and event venue stocked entirely by donations and run largely by volunteers. The store hosts readings, concerts, panels, parties, stand-up comedy, spelling bees, trivia nights and more; offers great coffee, wine and beer, homemade baked goods and snacks; free wi-fi; and the opportunity to rent the space for private events. All proceeds benefit Housing Works, the nation's largest community-based AIDS service organization. Since 1990, more than 20,000 homeless and low-income New Yorkers living with HIV/AIDS have received lifesaving services including housing, medical and mental health care, meals, job training, drug treatment, HIV prevention education and social support. Launched in 1985, SPIN has established itself as one of the most influential voices in music and culture. From the next big things to innovative icons, SPIN provides the most comprehensive coverage via SPIN magazine, SPIN.com, SPIN Digital, and SPIN Earth. With a guaranteed circulation of 450,000 readers, SPIN magazine, a monthly, currently reaches an audience of over two million.